What if all children in Western Tidewater had the educational experiences they need to become successful in school and in life? That is the question the UVA CASTL team is working hard each day to find the answer to. In our state, millions of dollars from private and public funds have been invested in early education, but funding alone will not get us to the goal of ensuring that ALL children have high quality educational experiences. The hard work of parents, teachers, directors, advocates, business leaders and philanthropists working together is what will make this vision reality! Included in the state budget was funding to pilot the STREAMin3 Curriculum developed by UVA CASTL in The New E3 School in 50 classrooms from diverse regions across the state. Thanks to the Obici Healthcare Foundation, $1m in private funds were leveraged to expand the pilot into 50 additional private, faith-based, VPI and Head Start Classrooms in Western Tidewater, taking the total number participating to 100. Additionally, all kindergarten classrooms across the state are mandated to participate in the VKRP by fall 2020. These are big developments! Virginia’s early education professionals are hustling this Spring and deserve to be commended. This is an exciting time for early education in our state and we are grateful for the UVA CASTL team and all the teachers working hard each day to provide the highest quality educational experiences for our children. Everyday early educators work with children who exhibit behaviors that are difficult to deal with. Our early childhood programs and teachers are struggling to meet the needs of children who have disabilities, mental health issues, challenging behavior and social-emotional skills that are still being developed. Children in Pre-k are expelled at over 3x the rate of K-12 students. 250 children are expelled or suspended from preschool each day on average. Most of the children expelled from preschool are from low-income families, are children of color or have disabilities. Boys and African Americans are 2x more likely to be suspended or expelled. Research clearly states that ALL children benefit from high quality early learning. Sadly, the children who need early education the most are being suspended or expelled at higher rates than their peers. Kicking young children out of preschools and elementary schools is not the answer. Suspension and expulsion sets children up for failure not success. The goal of early education is to create a preschool to workforce pipeline, not a preschool to prison pipeline. Our goal should be to prepare ALL children for success and to help families navigate the system of evaluation and intervention services to get the help they need. Address mental health issues as early as possible and refer families to appropriate services. Assess the needs of young children and provide support to help them develop their social and emotional skills before they enter kindergarten. Invest in our teachers and provide professional development that equips them with the tools they need to work with children who have behavioral issues or special needs. Provide evidence-based curriculum with social-emotional development strategies. Virginia is moving in the right direction. Governor Northam addressed the issue of pre-k through third grade expulsion in 2018, but there is still work to do. We must continue to make this a priority! Gilliam W. Ph.D., (2008) Implementing Policies to Reduce the Likelihood of Preschool Expulsion. (Policy brief 7). https://medicine.yale.edu/childstudy/zigler/publications/PreKExpulsionBrief2_34. Malik, Rasheed. “New Data Reveal 250 Preschoolers Are Suspended or Expelled Every Day.” Center for American Progress. https://www.americanprogress.org/issues/earlychildhood/news/2017/11/06/442280/new-data-reveal-250-preschoolers (November 6, 2017). “Policy Statement on Expulsion and Suspension Policies in Early Childhood Settings.” U.S. Department of Health and Human Services. U.S. Department of Education. 2016 National Survey of Child Health. When you play or watch baseball, you are seeing STREAM (science, technology, reading, engineering, arts and math) in action! Both of my boys are baseball fans (one loves the Yankees and the other is a Red Sox fan). When I asked my younger son if he wanted to play baseball, he replied, “ Do you have any idea how hard it is to hit that ball with a bat?” That was his way of saying no. He is absolutely right about what it takes to move that ball. It takes force and energy to get that ball from the pitcher’s mound to home plate. Think about the science in every pitch. Then there is the engineering of the ball, bat, glove and helmet. And let’s not forget about the math (statistics! statistics! statistics!). Did anyone read the book or see the movie Moneyball? The game of baseball uses a lot of math to figure out batting averages, runs and the speed of every pitch. The baseball team with the most World Series titles is the New York Yankees. It is 27 to be exact. The oldest baseball park still in use is Fenway Park (a must see and so old school). Jackie Robinson was the first African American to play in Major League Baseball. He played for the Brooklyn Dodgers and helped his team reach the World Series. The song Take Me Out to the Ball Game is about a girl named Katie Casey who loved baseball. There was a time when you would not have seen a woman at the ballpark. This song that we all love and sing at the seventh inning has a much deeper meaning. Playing catch and throwing a baseball. Measuring how far you throw the baseball and graphing it. Collecting baseball cards (The Dollar Store sells them) and matching them. Going on a baseball scavenger hunt. Collecting baseball hats and sorting them by color and logos. Creating a baseball field with art materials. Creating your own ballpark outside using your imagination. Cheering on your favorite team in your jersey and baseball hats (we even dress up our Labs). Reading a book about baseball. Going to see a little league, minor or major league game as a family. Go Tides! Go Flying Squirrels! Go Nationals! It is like any sport – there are so many lessons to be learned about discipline, hard work, grit, stick-to-itiveness and teamwork. Not to mention, it is so much fun to take in a game with family and friends on a beautiful spring or summer day at the ballpark. The turnover rate among early education program staff in the U.S. is 30%. High turnover rates can impact program quality and affect children. Studies show that frequent turnover among early educators prevents children from developing secure attachments with their teachers and can negatively impact children’s social and emotional skills as well as their language development. It also hinders the formation of healthy relationships between parents and their children’s teachers. So, why do teachers leave the field so early and so often? In a word, money! Low wages are cited as the number one reason why teachers leave their jobs. Early educators are among the most poorly paid professionals in the nation. Many share similar educational backgrounds as public school teachers but earn roughly half to one third of a public school teacher’s salary. Not surprisingly, the more educated and qualified they are, the more likely they are to leave. Compensation in this profession is often lower than parking lot attendants, cooks and cashiers. Lack of health care and retirement benefits are also factors in the high rate of turnover. Thankfully, many who choose a career in early education see their work as a calling and feel personally rewarded by what they do outside of their paychecks. Most programs weight teacher qualifications more heavily than financial needs when considering who would be eligible. Only one program reviewed awarded larger bonuses to the providers with the lowest wages, despite the fact that compensation is overwhelmingly cited as the main issue in teachers’ decisions to leave the field. Most programs set a minimum level of education for eligibility. The goal of these programs is to retain the most “highly qualified” individuals. One concern to this approach is that there is weak evidence to prove that degrees produce more quality teaching and these requirements may disproportionately disqualify many great teachers from accessing the programs. Many programs require providers to participate in state career lattice systems. These systems are a useful source of information about the ECE workforce and can help states understand how bonuses impact provider outcomes over time. Most programs allow providers to receive bonuses annually, however, some only allow a bonus every other year to avoid the bonus becoming a reliable source of income for the provider. Most programs do not restrict recipients’ use of funds. Some require funds to be used on tuition or classroom materials, which may not lead to the overall goal of improving compensation and retaining employees. The problem of turnover is complicated and more prevalent in certain regions, states and districts than others. Areas that serve students of color and those from low-income families have the highest teacher turnover rates. The problem is complex and the need for policy action is imperative. To ensure that our children have optimal early education experiences, we have to develop long-term solutions to retain effective teachers. Solutions that incentivize great teachers to stay in the field should include increased compensation, professional development, coaching, mentorship and support from school administrators and parents. Ignoring this issue or implementing short-term “band-aid” solutions only guarantees that we will continue to see critical shortages of early education teachers in the communities where they are most needed. Virginia needs to take thoughtful action NOW to make early education a desirable and sustainable profession for teachers. Many of you were with us when we launched WE3: Women Elevating Early Education last spring. The First Lady of Virginia, Pamela Northam was with us at The New E3 School to kick off the initiative. Governor Northam’s Year in Review will be given out after the State of the Commonwealth. An image of the First Lady of Virginia visiting with our children on the playground will be featured. Many of you may not know that she worked side-by-side with our architect, builder and me to create a place that would stimulate a child’s imagination and creativity more than a traditional playground. WE created an open-ended outdoor play area for children to make discoveries, explore and interact with their environment. This approach connects children back to nature and stimulates creativity and imagination. I like to refer to it as our “old school” playground. It reminds me of how I grew up exploring, running, climbing and using my imagination outside. We wanted you to be the first to know that our school is featured. WE are excited that the First Lady of Virginia has made expanding access to high quality early education a priority. Our cause could not have a better spokesperson or leader. If you haven’t toured The New E3 School, email me at lhoward@e3va.org and let’s set up a visit. The increased ability to gather and use data is one of the most important developments the education world has seen. To best serve our children, states must be able to answer important questions about the long- and short-terms outcomes of the programs and services they provide. Early childhood education data, combined with data from home visiting programs and health programs can be a powerful tool to help improve the services offered to young children and their families. Recognizing the importance of integrating data, the SHINE (State-level, Home Visiting Integration with Early Childhood Data Systems) Initiative aims to share its lessons learned on data integration in five states and make resources available to support effective data integration across programs and services in other states. Bringing together data from various organizations offers much promise, but integrating systems can be technically challenging. There are issues around collecting, aggregating and analyzing large amounts of data and making it available to the stakeholders who need it while keeping individual information private and confidential. Despite these and other complications, measurement and data collection are activities that our educational and human service institutions need to undertake and understand, however, to give our children the best possible experiences from pre-k through graduation. Professional development is also needed to help educators, home visitors and health professionals interpret and use data appropriately. Data analysis helps us to expose patters, trends and exceptions and understand whether our methods and service delivery approaches are effective. It is critical that all the sectors of early childhood services work together to integrate data and have the ability to answer important program and policy questions. When programs work together instead of in siloes, they are more effective and efficient. To read the full report from Child Trends click here. A child care desert is a census tract with more than 50 children under the age of five where there are no child care providers or so few options that there are more than three times as many children as there are licensed child care slots. The Center for American Progress reports that child care deserts in Virginia and across the nation are more common in low-income areas. This is an important issue to address, especially in a state like Virginia where 74% of mothers participate in the labor force. 61% of low-income families live where the child care supply is low. Despite these numbers, Virginia fares better overall than the average U.S. state where 51% of all people live in areas where child care is lacking. How Do We Improve the Stats in Virginia? E3: Elevate Early Education along with First Lady, Pamela Northam, the Virginia Children’s Cabinet and many other stakeholders in our state are working not only to increase the availability of early education programs, but to ensure that high qualityis at the centerpiece of our efforts. Increasing access alone isn’t an acceptable solution for our state’s children. 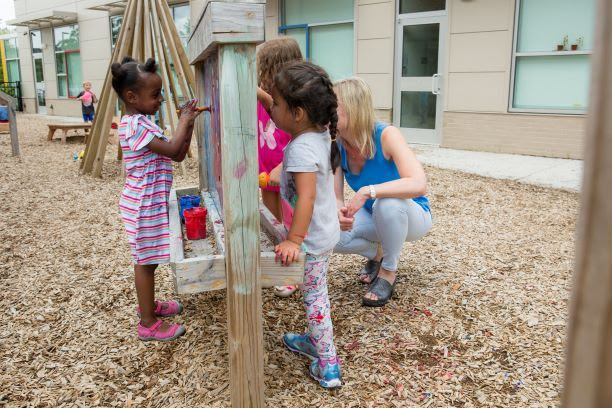 Our goal is to increase access to HIGH QUALITY programs like The New E3 School, a mixed-income, demonstration-model school created using the latest research in child development and early education located in the Park Place neighborhood of Norfolk. Be a prototype model school, helping to increase awareness about what high quality programs look like. To demonstrate how a mixed-income model school can be successful. To create innovative solutions for serving children from low-income families, like scholarship programs for those who cannot afford full tuition payments. Utilize research-based curriculum that incorporates coaching and professional development for continuous improvement. Demonstrates its’ success in preparing children for kindergarten. E3, in partnership with The University of Virginia’s Center for Advanced Study of Teaching and Learning is currently piloting the STREAMin3 Curriculum Model, which was developed for use in The New E3 School in over 50 private and faith-based classrooms across the state. This curriculum is innovative, engaging and interaction-based using the latest developmental and early education research. The STREAM: Integrated, Intentional, Interactions (STREAMin3) Curriculum focuses on five core skills that form the building blocks for later learning and six STREAM skills – Science, Technology, Reading, Engineering, Arts and Math to prepare children for success in kindergarten and beyond. The model includes a variety of activities and routines, coaching, assessments and professional development for teachers. Virginia is making strides with the first lady making high quality early education a priority. Read the full report on child care deserts here. For more information on the STREAMin3 Pilot click here. Gingerbread House Building and Decorating Event: Thank You! Our gingerbread house building and decorating event was a huge hit with the neighborhood and New E3 School children and families. It was fun to see the excitement that filled The New E3 School last weekend. Adults and children equally enjoyed the holiday activity stations & decorating the gingerbread school modeled after The New E3 School. Thank you to those of you who gave your time last Saturday as volunteers. And, a special thanks to all of our sponsors. The fun-filled day would not have been possible without YOU! We have many family traditions, but a few of my boy’s favorites are seeing what the elf left in the Advent calendar (not so much anymore), building a Lego Christmas village, building & decorating gingerbread houses and making (and mostly eating) homemade cinnamon rolls on Christmas Day. Every year since my two boys were young the activity that seemed to grow in popularity was building and decorating gingerbread houses. Over the years, we invited friends, family and neighbors to join us in the festivities. As the boys grew older, we started having a competition to see who could make the best one. This year I asked my youngest son, Liam what he thought we should do for our annual event. He replied, “ I want to build the biggest gingerbread house ever!” I think those holiday reality baking shows are influencing him. A few minutes later he was texting a dear friend and almost-like-a-grandmother his idea. It wasn’t long before it became a BIG idea and a BIG event. And, that is how the gingerbread house-building idea was born. Then we all starting talking and thinking about how we could make this an event for our children and families at The New E3 School, the neighborhood of Park Place and ALL children in the community. As the plans evolved, we realized that we were going to need an architect and builder. T + M Architects and Hourigan Construction stepped up to help us make this plan come to life. My two boys, Zack and Liam, Caroline McCartney, John Tymoff with Tymoff Moss Architects and I had an official meeting to brainstorm ideas and determine next steps. That is when it was decided that we should design and build a gingerbread house modeled after our school. The children and families of The New E3 School became involved in the planning too. We made a list of all the supplies we would need from plywood to graham crackers and candy. Then we came up with a plan on how to raise the money to make sure that ALL children and families could participate. Now, we are asking YOU to help us create a New E3 School family tradition. Will you? We hope to see you @ The New E3 School on December 15th!! After careful review and consideration of the local, state and national data and expert presentations, the Obici Healthcare Foundation Board of Directors determined that investment in the early childhood years is critical to health status and well-being down the road. The $6 million in targeted investments appropriated during the 2018 General Assembly Session to improve the quality of children’s early education experiences set the stage for the Obici Healthcare Foundation’s leveraging $1 million in private funds to expand initiatives in Head Start, Virginia Preschool Initiative (VPI), faith-based and private programs in the Western Tidewater area. 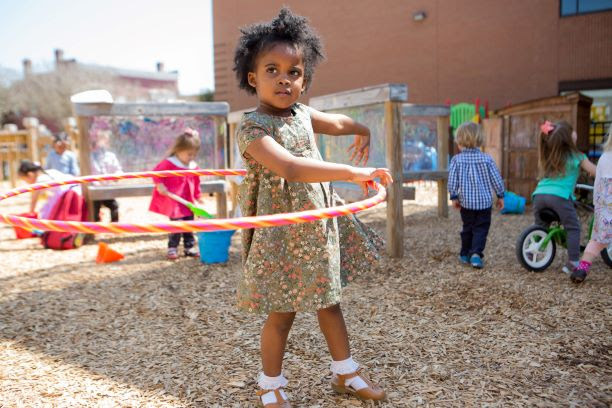 Expands the pilot of the preschool version of VKRP into programs in the Western Tidewater area to include Suffolk, Franklin, Surry, Isle of Wight and Southampton County. The VKRP readiness assessment builds off the Phonological Awareness Literacy Screening (PALS), to include assessments of children’s skills in math, self-regulation and social skills. A preschool version of the Virginia Kindergarten Readiness Program has been piloted in The New E3 School for the past two years. Supports CLASS observations in Head Start, faith-based and private classrooms. Pilots the STREAMin3 curriculum model in Virginia Preschool Initiative (VPI) and Head Start classrooms. Educators, superintendents, business and community leaders, policymakers and philanthropists attended last week’s event to launch the public-private partnership. Speakers included Dr. Bob Pianta, Dean of UVA’s Curry School of Education and Founder of CASTL, Delegate Chris Jones and Annette Beuchler, President & CEO of the Obici Healthcare Foundation. We applaud the innovation, data-driven approach and focus on impacting children by improving their early education experiences and ultimately their health status. Read up on the transformative efforts in Tidewater News and The Suffolk News-Herald.